*This also appears on PBA.ph. Let's get one thing out of the way — this is going to be a helluva tough game for Gilas Pilipinas. Objectively speaking, the Filipinos are going to be significant underdogs in this matchup. China is bigger, younger, and deeper. They have great size at every position, they have one of the best centers in all of China, a slew of sharp-shooters, and maybe just maybe the point guard who will unseat Jayson Castro as the best PG in all of Asia. This is a battle Gilas can win, yes, but the odds won't be in their favor. Having said that, one thing that can propel Gilas to play beyond their perceived limitations is the fact that there is bad blood between these two teams. Two years ago in Changsha-Hunan, it was China who beat Gilas in the FIBA Asia Championship Final in what was a physical and not-so-tightly officiated contest. The Filipinos have a bone to pick with the Chinese, and two years of simmering resentment may just be enough to squeeze out 110% effort from coach Chot Reyes and his wards. Of course, it also goes without saying that the Philippines are no pansies. Jayson Castro is still an elite floor general, Terrence Romeo can catch fire at the drop of a hat, and Japeth Aguilar can still jump out of the gym. The Philippines may not be as big or deep as China, but they still have the talent and, more importantly, the motivation to exact vengeance on the defending champions. - Some people believe not having JMF is not as bad as it seems. They're wrong. Not having JMF in the middle leaves Gilas with a Kraken-sized hole in the paint. That's going to be a huge problem, especially against bigger teams, and no team in this competition is bigger than China. The Chinese have three guys who are 6'11 or taller, and every single one of them is highly skilled. These aren't lumbering logs who move like turtles. All three of China's centers are not only tall but also long, physical, and vicious. In this case, Gilas is definitely worse off for not having the 3-time MVP. We already saw a glimpse of JMF's potential for the international game when he put up 9 points and 7 rebounds per game in the SEABA Championship, but sadly we probably won't see him in this tournament and almost surely not in this game. - With Fajardo out, the onus is on both Japeth Aguilar and Christian Standhardinger to step up big time. Neither of them is a true center, but they will have to play that position against foes who are, again - and this cannot be stressed enough - bigger and bulkier. Both are serviceable small ball centers who can fit well in coach Chot's dribble-drive system, but defensively they may be a little overmatched. Still, both Aguilar and Standhardinger (add Almazan, too) will be standing strong, and one thing they do have going for them is agility and athleticism, which they can use to counter China's considerable edge in size. - There are two things that will go for Gilas, and one of them is outside shooting. 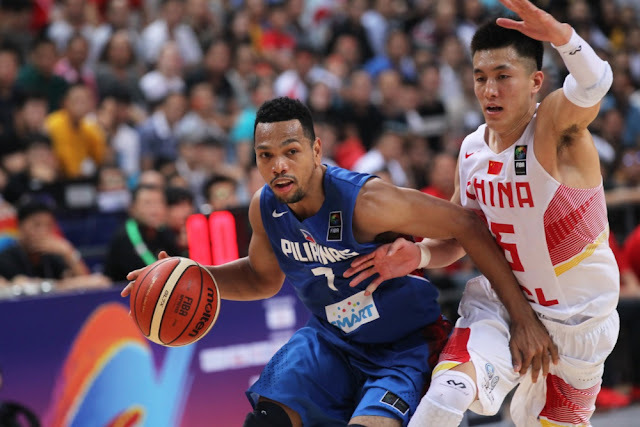 Even China's size can be stretched thin if Gilas's corps of gunners can hit their stride and catch fire. That is something that could have helped them in 2015 in the Final of that tournament, and that's something they must do here to negate China's bigs and force them to go small to run after Gilas's snipers. Matthew Wright, RR Pogoy, Terrence Romeo, Carl Cruz, and Jayson Castro must all shoot well from the perimeter for Gilas to have a shot at winning this game. 4) PHI: WHERE'S THE BLUR? - In 2015, Jayson Castro was named Best Point Guard in Asia again, but he was thoroughly outplayed in the Final by his counterpart from China, Guo Ailun. This time around, Castro must not let that happen again. Castro needs to lead this team not just on paper, in name, or through voice. He needs to lead by example, and that means he must put up big numbers. If he doesn't Gilas's chances of winning diminish dramatically. Castro last game vs China: 8pts, 3/14 FGs, 1 triple, 6rebs, 1ast, 1stl, 4 fouls. 5) GUO AILUN: SET TO REPLACE CASTRO? - On the other end, China has perhaps the most well-rounded PG in all of Asia. Guo Ailun has great size, speed, shooting, and physicality. He sees the floor well and has a penchant for scoring when his team needs it the most. He has shown this many times for his club team Liaoning in the CBA, and he has displayed that for China as well, most notably in their comeback win against Korea in the 1st round of the 2015 Asia Championship and against Gilas in the Final. Needless to say, Gilas must find a way to slow Guo down. Last game vs Gilas: 19pts, 6rebs, 2asts, 1stl, 1blk, 2 triples. - Guo is good, but the biggest thing (quite literally) standing in Gilas's way in this game will be China's Walking Great Wall composed of Han Dejun, Li Muhao, and Hu Jinqiu. Each of the men forming this three-headed beast of a frontline brings his own unique skill-set to the table, and each will be challenging to contain. Han is known as the "Shaq of the CBA. He overpowers his opponents and is one of their best low post offensive players. Li won't score a lot, but he is well-known for his defensive prowess and rebounding. He has long limbs and will try to block every shot. Hu is one of the youngest guys in the entire tournament, but he has maybe the biggest upside. He has similar skills to Yi Jianlian, and is actually seen as his heir apparent. Even this early, he has several scouts salivating at the prospect of having him play in the NBA. This is a kid who is of the same generation as the likes of Mike Nieto, Matt Nieto, Aljun Melecio, Kobe Paras, and Jolo Mendoza, but unlike them who are still playing in college, Hu is already playing professionally and has his eyes set for bigger things. FOR MORE FIBA ASIA NEWS, CHECK OUT THIS LINK!